Buy All-in-one Brother MFC 465cn with CISS with CISS and make 30 times more quality prints for the same money! Pay only 0.04 USD for A-4 full color print! More features with Brother mfc-465cn printer. True? The brother mfc-465cn wireless all-in-one inkjet printer is just a device made for a home office use, which moves a fairly light amount of paper. The device is an inexpensive multifunctional printing device. It has a max duty cycle of 2 500 pages per month, and it means that one should try to print under 800 pages per month to make printer's life longer. It has got multiple color cartridges. This makes the printer saving over single cartridges, so you don't need to throw it away as soon as one color is empty. Also you should consider that this printer needs to make 4 passes over one sheet when printing something in color, and this way mfc-465cn printer works out to the best use of about 200 printed in color pages per month. So, the device cannot print long and break happy. In fact, this really means that if you need more than 200 pages printed every month, you should think over another printer which can manage with a higher duty cycle. It may be a representative of a dcp series like BROTHER DCP-120C. Made for a home office, the multifunctional brother mfc 465 can be networked easily via an Ethernet connection if you have to connect more than one computer. If there is a network in your home office or you have more than one PC, it is possible to print, fax and scan from any computer from the network. It can be easily installed on PCs with Windows, Linux or Mac operating systems. First, we must say that we were impressed by the budget brother printer mfc-465cn as it is user friendly, convenient and well-designed MFU. Sure, being in such a price category at least make it more attractive, but not actually mean more appealing. The basic design is similar to the BROTHER DCP-115C, with front-loading cartridges. It's also equipped with paper output tray deeply inside the internal ports, but with added Ethernet for printing in networks. Its card reader is on the front; the fax inputs are on the left, next to the strangely positioned power socket. There is an automatic document feeder (ADF) for copying multiple sheets on the to, which makes the whole process simple. The office credentials are boosted by the adding of fax capability. The 2inch LCD display makes it a lot easier to use than mentioned dcp-115, and the menu is relatively simple in navigation. Brother mfc 465 can print up to 30 pages per minute (ppm) in B & W, or only 25 color ppm, if you print in draft mode. If higher quality printing required, for example 6000x1200 dpi, you have to wait as printing speed is much lower. The input tray holds one hundred sheets of paper up to 8.5x14in size, which is handy. And if necessary it makes 100 copies of a document at one time without adding paper again and again. The special 4x6 photo paper tray holds twenty sheets. Also it can print photos from memory cards directly without direct connection to your computer. Special 4 x 6 photo paper tray holds up to 20 sheets. It can also print photos directly from a memory card, not using your PC. Brother printers mfc 465cn are supplied with the inch flip-up color LCD screens for previewing photos before printing. The device holds up to 10 sheets in the automatic document feeder for copying. It copies at 22 pages per minute B & W or 20 pages per minute in color. Its copy resolution has a maximum of 1200x600 dpi. If ADF is used for multi-page coping, it can also sort the output. The device can enlarge the original up to 400%, or reduce down to 25%. It can print at 600x2400 dpi resolution in both black-and-white and color resolution, with objects up to 8,5x11 ins on the glass or 8,5x14 through the ADF. Fax capability of mfc-465cn brother is 1 page per second, including the ability to hold up to 400 pages in out-of paper memory, just in case the printer will run out of paper. 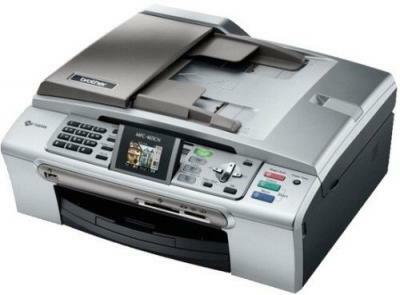 It receives B & W and color faxes, as do fax forwarding and automatic redial but only in B & W.